The Bride, the Groom and the hungry Guests. How do you make the menu you offer to your guests as memorable as the ceremony you have planned? You and your hubby will probably be too excited and busy to eat during your celebratory party, however, your guests will be looking forward to having a good time and having a scrumptious meal. Talk to friends and family members and get their recommendations for caterers because not all cooks are culinary experts. Do not hire anyone without sampling his/her food first. If you're going to have a back yard wedding consider using Jason from Luigi's. They are located in Lincroft, New Jersey and will travel within a 100 mile radius. The phone number is 732­-842­-2122. I've used Jason's services to cater a backyard affair and several sit down dinner functions. Their staff is knowledgeable, always willing to please and all the guests have been delighted with his food choices and excellent service. 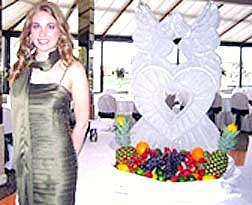 When choosing the food for your reception it is necessary to keep in mind the theme of your special day. If you are having a New Orleans Mardi Gras theme you would not want to serve lasagna and salami, instead you would serve Cajun and ChantlCreole dishes. Your menu choices should also coincide with the time of day your reception will take place. An early morning ceremony lends itself to breakfast or brunch foods. Appropriate menu choices would be eggs, pancakes, French toast, muffins, croissants, fresh fruit, cheeses and lunch meats. Evening receptions tend to be more orientated towards a sit down dinner or buffet, which are more expensive than an afternoon celebration. If you are going with a traditional dinner, talk with several caterers and discuss their menu options. Typical entree choices include; chicken and pasta, which are less expensive than beef, fish, or veal. 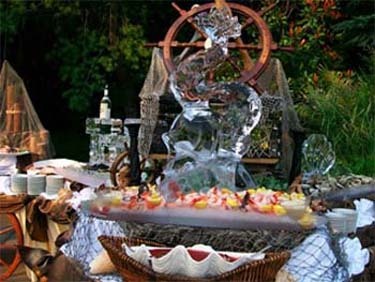 Most caterers will have you pick three entrees from which your guests can choose. If you're having a beach or any outdoor bash, remember that you should be careful with refrigeration. You want your food to remain fresh and not spoil in the heat. I would stay away from dishes that spoil easily like, mayonnaise, uncooked fish, and cheeses. 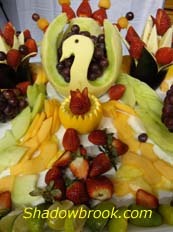 Include a melon tray for your wedding reception food ideas. Some of your guests will have dietary or religious restrictions. It is important to know your guest’s needs and be prepared to offer a vegetarian, diabetic, or kosher meal to those guests requiring them. Whether you are going with simple or extravagant food choices, I do hope my wedding reception food ideas will help you with your decision making process. Please see my other ideas which can be found here.